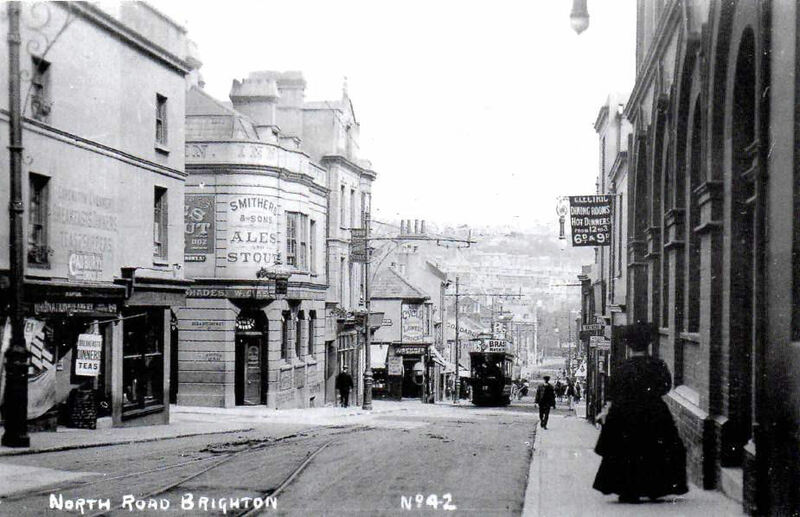 North Road; undated - click on image to open a larger image in a new window. Have been trawling through old photographs again and just could not resist publishing this one. It is really great how much we can learn just taking note of small details; like the sign for ‘Hot Dinners – 6d and 9d. Hope you enjoy it and maybe some of you can point out other items of interest. The notices showing dinners and teas are a nice example of the main theme to my discipline, Landscape Studies; in that all landscapes show Continuity and Change. Then, it was because this North Laine area was the one of the main areas of manufacturing industry, power supply and transport links, all of which employed many people in firms with no canteens or mess rooms. These days North Laine is awash with coffee houses, cafes and bars all providing employment but crucially these supply the leisure market. Thus the changing economy of the city to overwhelmingly that of a service economy. I agree, Jennifer, it is a lovely photo. Thank you for continuing to entertain and educate us. This is a beautiful photo. Whoever took it gave a lot of thought to its composition. I don’t know, but I imagine, that taking photos, in those days, took a bit of time and patience. In any elapsed time, the whole composition would change. The adverts are, as always, interesting. There is one for Brasso on the tram, I think. I love the lady on the right, too. It’s interesting to note that the Dolphin Inn building is still there today, with its rounded entrance on the corner of Foundry Street. Currently it houses MADE (Make Art Drink Eat). On the next corner down, the building with the Cycle advert over the entrance is largely unchanged, and now occupied by Leoframes. Further down still, on the corner of Upper Gardner Street, is the Heart and Hand pub, with the distinctive row of four chimney pots on its roof. Much further down on the left hand side, on the corner of Vine Street, stood the Red Lion. Although that building is now occupied by Union, a delicatessen, the Red Lion signs are still there at the top of the facades, with an engraved lion between two of the top windows on the Vine Street side. Can someone please tell me what the brick-faced building is on the right, where the lady is just passing the entrance? The Dolphin Pub on the corner of Foundary Street, the first pub I went to, it was run by Ron and Joyce Cragg who later went to the Friars Oak, Hassocks. I worked at Woodcocks Carpet wholesalers 1959/ 61. The building is still there, but not a pub anymore. I seem to recall the Public Library being in North Road and of course the Swimming Baths. I wonder if the building on the right was connected to either of these later on. I am talking about the 50s onwards. Thank you for posting Jennifer. Do we know who took it and the date? I would guess about 1905? The brick building on the right of the picture may have housed the Corporation Electricity Board. Alan, the brick building must be the Brighton Corporation Electricity Works at 41 North Rd; this is now the YMCA building. It appears that the brick-faced building on the right was the main distribution centre and works for the South Eastern Electricity Board (later Seeboard) in the 1970s, but was it originally built for that purpose? The Dinning rooms in question here belonged to my Great Aunt Annie Mary Trigwell at number 38. She was married to my Great Uncle Arthur Plank. The building was demolished along with the Grand Theater, The South Electric Electricity Board building and several other business’s above. The site later became the YMCA building.